Lit from Within: Golden Oldie Red? Red Icon! M.I.C... see you real soon! K.E.Y... why? because we love you! 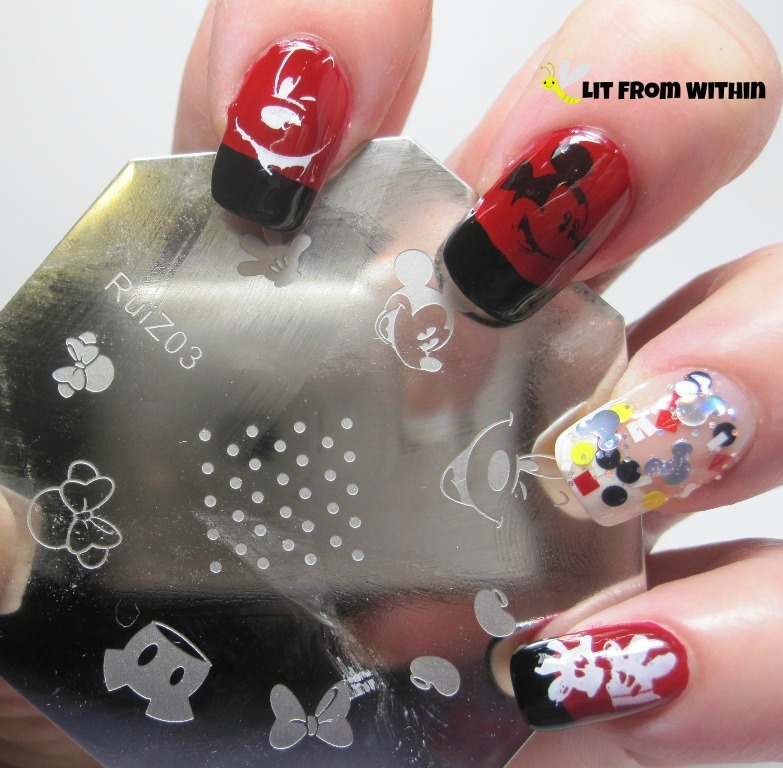 When thinking of nail art to do with red, I couldn't help but think of my fave Golden Oldie Icon - Mickey Mouse. 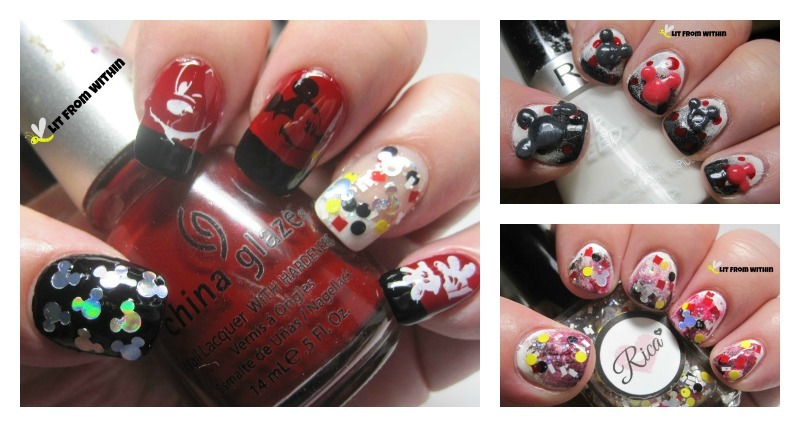 Today, I have 3 manis I did in homage to that famous mouse! First up, the last of the talons. For my Golden Oldie Red, I chose China Glaze Phat Santa, one of my fave classic red cremes. I added a black accent and tips and stamping with Cult Nails Nevermore, Revlon Spirit, and Born Pretty Plate Z03. Isn't that glitter just everything Mickey? 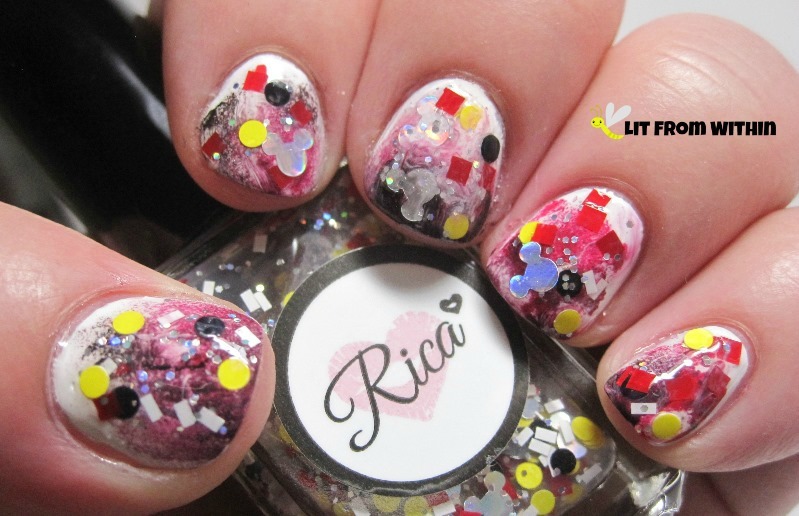 On my ring finger is Rica Real Girls Wear Mickey Ears, and Rica also sent me a few extra holo Mickey glitters that I placed on my thumb! 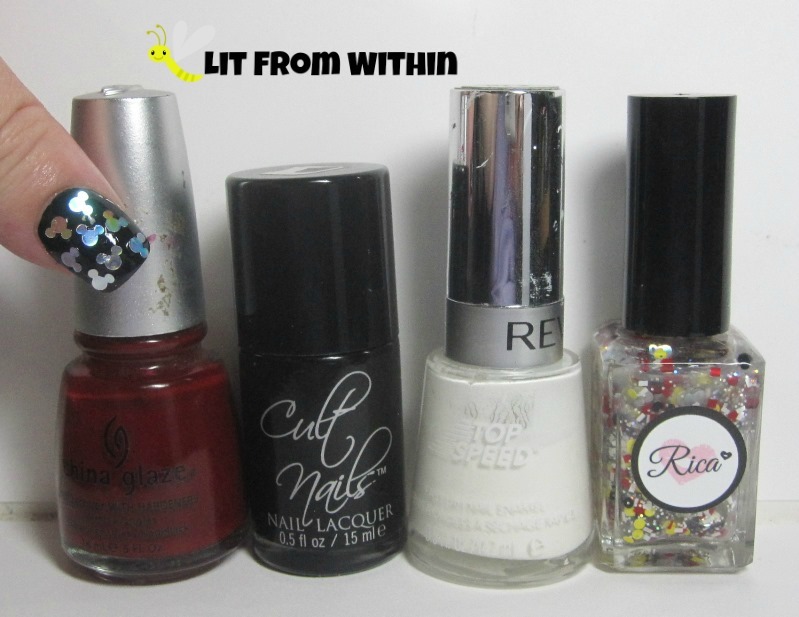 Bottle shot: China Glaze Phat Santa, Cult Nails Nevermore, Revlon Spirit, and Rica Real Girls Wear Mickey Ears. I love Mickey Mouse (I have two Mickey watches that are pretty much all I wear!) and I've been trying to create a perfect Mickey manicure for a while. 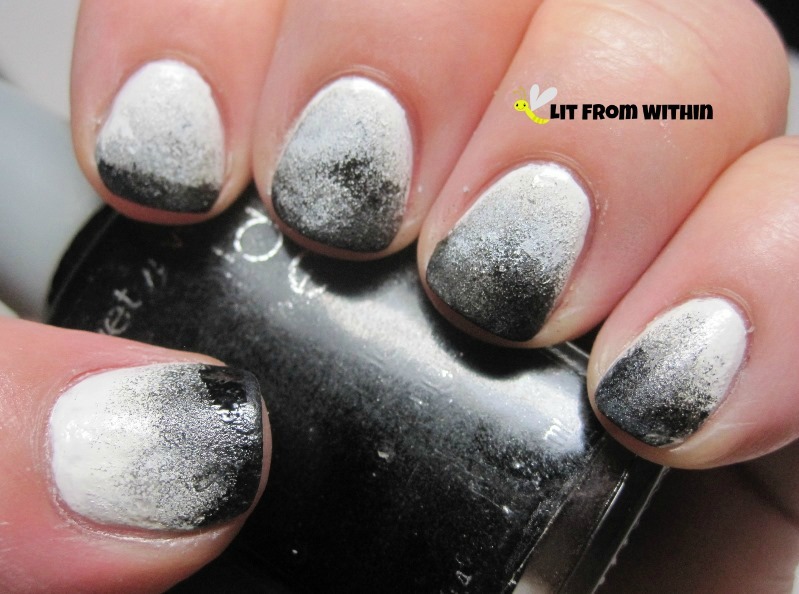 This was my first attempt - Revlon Spirit sponged with Wet 'n Wild Black Creme and OPI Over and Over A-Gwen. Looks like a murder scene. When I put on Rica Real Girls Wear Mickey Ears, it just looked like Dexter meets Mickey Mouse. Not exactly what I was going for. My second attempt was more successful! Revlon Spirit sponged with just Wet 'n Wild Black Creme. 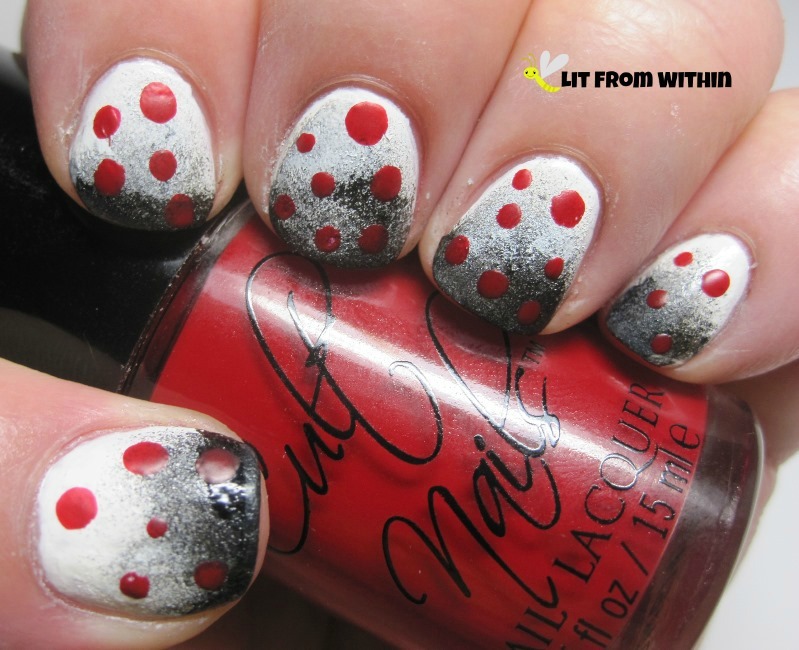 I saw this cute dotticure by Linda165 and did my version with Cult Nails Kiss, a matte red. I made these cute Mickey heads out of acrylic, colored powder, and a 3-D nail art mold off Ebay. I totally made these! So cute. Are you a fan of the Mouse? These are all so cute! Loving the Micky Mouse shaped glitters the most. I totally fell in love with those glitters! I love the Mouse glitter! Loving the Mickey shaped glitters! So pretty! You killed me with that murder scene comment :D. And I love all your manis!! 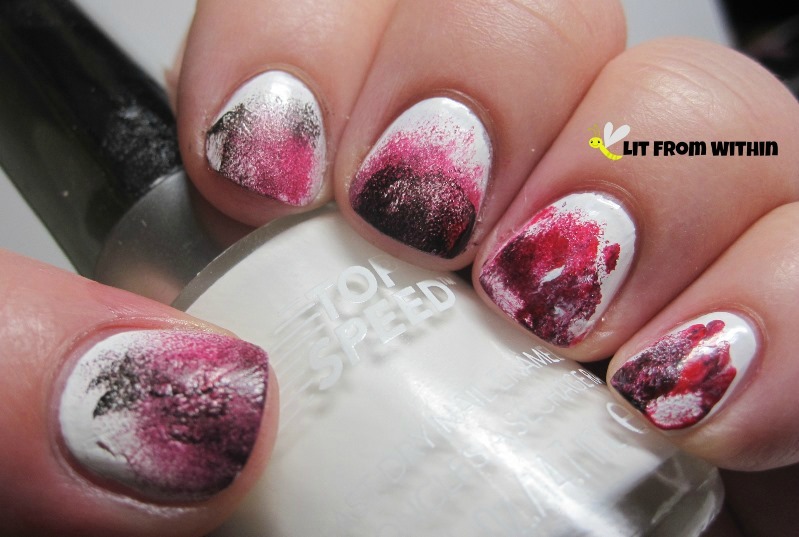 LOL Murder scene nails...then Murder scene nail that had a party! 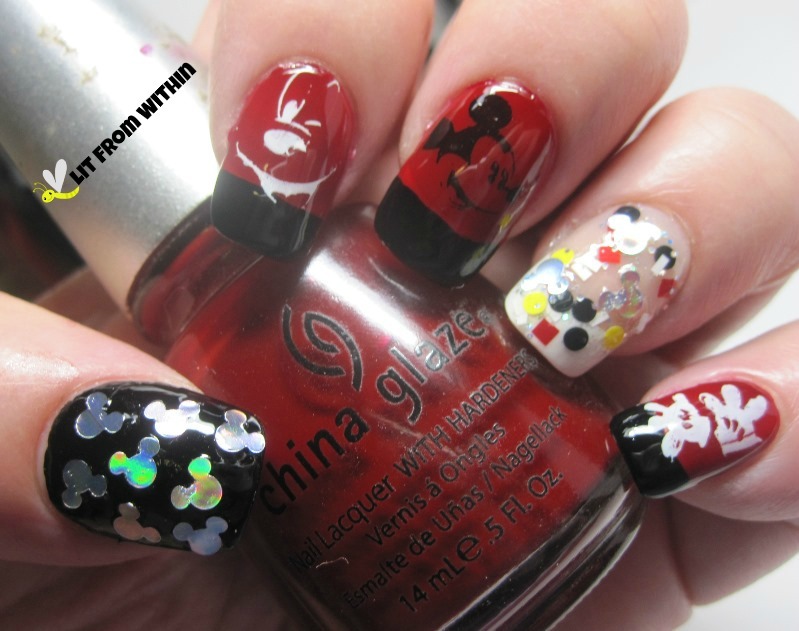 I love the Mickey Mouse nail art! Wow, here some lovelies from Mickey Mouse, super creative. Murder Scene was the bomb! Aww so cute. My daughter would love this. Mickey Mouse glitter?! WHAT!??!?!?!? LOVE! I love Mickey Mouse anything. SO freakin' CUTE! Gotta have some mouse glitter!!!!! 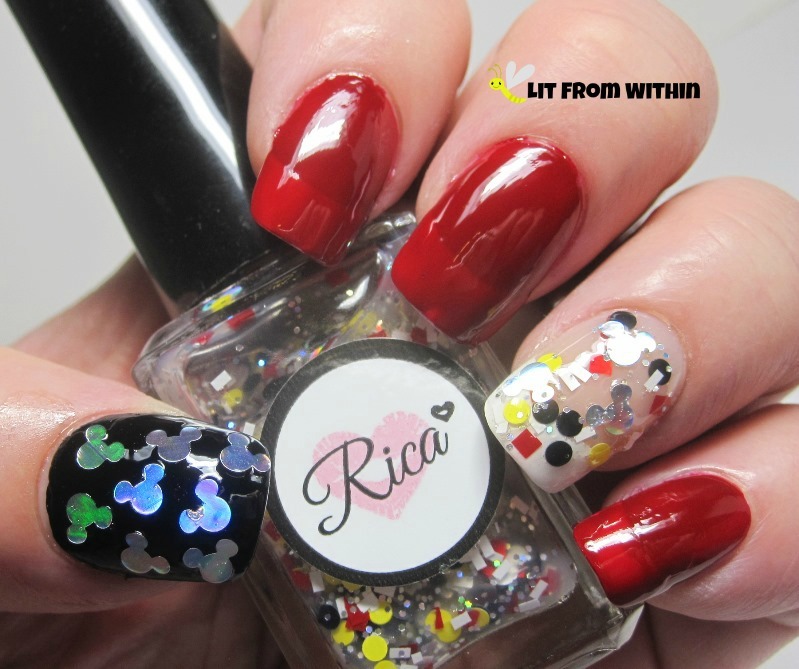 Mickey Mouse glitters are so freakin' cute! 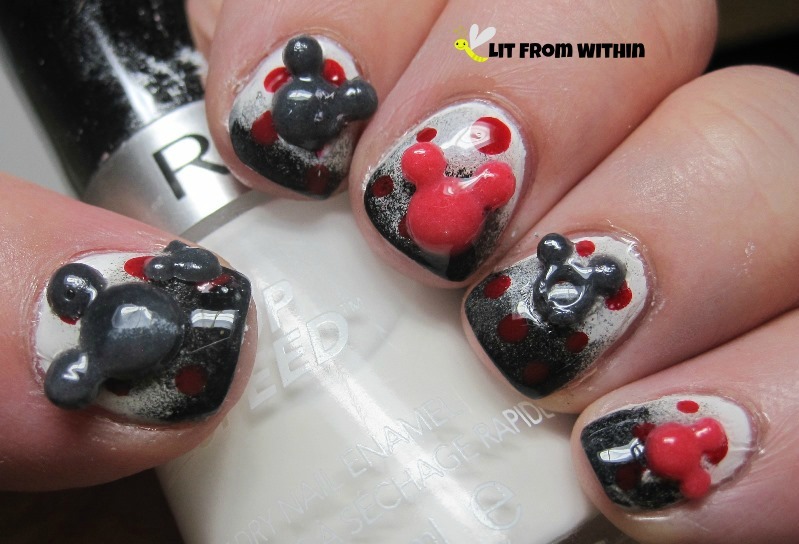 This mani is something I'll wear going to Disney, just because! How do I not have a Mickey Mouse glitter polish yet?! Amazing job! I love how you made your own Mickey heads, that's so creative. Thank you! I need to get out my molds again and play. The first and the last one were my favorites! That Mickey glitter is fab! The Mickey glitter is definitely my favourite. THE MICKEY GLITTER!!!!!!!!!!!!!!!!!!!!!!!!!!!!!! =O Love it!!!!!! Your nail design looks awesome!